Sheffield United's hopes of qualifying for the Championship play-offs were dealt a major blow as they were beaten by Birmingham City at St Andrews this afternoon. Mark Duffy, the former City midfielder, fired Chris Wilder's side into an early lead on his return to the Midlands. But goals from Marc Roberts and Jacques Maghoma turned the game on its head and handed Garry Monk's men a lifeline in their survival battle. The result leaves United three points behind sixth-placed Millwall with two matches remaining. However, although the gap remains surmountable, the traffic between them and the Londoners has increased with Brentford and Bristol City both moving above them in the table. Wilder, whose team completes its season with matches against Preston North End and Bristol City, greeted the final whistle with a shake of the head. This was another big, big chance missed. With the home supporters cranking-up the noise before kick-off, Monk's side predictably looked to come bursting-out of the traps. But their hopes of pushing United back were dashed when Duffy broke the deadlock with barely six minutes on the clock. Having been deemed surplus to requirements by the hosts before moving to Bramall Lane and derided, albeit via social media, by many of those inside the stadium, the United midfielder celebrated his goal with particular passion. It enraged three quarters of the crowd and also referee Tim Robinson, who cautioned him before the re-start. But, from Duffy's perspective, a yellow card was clearly a price worth paying if it meant hammering home his point. Despite their behind the scenes politiking and rapid turnover in the technical area, City's plight remains a mystery to many within the game. True, more than three different managers have been responsible for scrabbling together their squad. But, peppered with expensive signings such as Marc Roberts, Jota and the suspended Harlee Dean, questions must be asked about its character and commitment. City answered some when, following a period of pressure, Roberts equalised at the near post. But the goal owed as much to some woeful marking as it did any great invention on their part. Maghoma, however, created and exploited his own opportunity midway through the second period thanks to a searing show of pace. It is a quality United lack and, on this evidence, will be desperate to acquire when the transfer window reopens this summer. 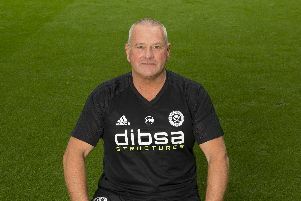 Wilder's plans appeared to have been thrown into disarray ahead of the fixture when Leon Clarke (back spasm), Simon Moore (illness) and Jake Wright (knee) were forced to withdraw. Although the latter two would almost certainly have started on the bench, Clarke's absence was a major blow after scoring 18 times this season including three in his last four outings. Duffy stepped-up to fill the void when, after being released by Lee Evans, he checked inside his marker and sneaked a low shot past David Stockdale's outstretched palm and inside the post. Evans saw a long-range effort palmed over as United went in search of a second and John Fleck had an appeal for a penalty turned down. Wilder, who felt the Scot had been pushed over as he raced to meet George Baldock's cross, will have been pleased by the start his team had made. But the defending which allowed Roberts to equalise in the 30th minute appeared to leave much to be desired. City, who had looked all at sea during the opening exchanges, actually finished the half on top. They began the second in a positive manner to with Blackman saving from Lukas Jutkiewicz. The United goalkeeper was powerless to prevent Maghoma edging City in front in the 69th minute, though, as his defence was left trailing in the midfielder's wake. Birmingham City: Stockdale, Roberts, Morrison, Colin, Kieftenbeld (Gardner 61), Maghoma, Davis, Harding, Jota, Adams (Ndoye 90), Jutkiewicz (Gallagher 86). Not used: Kuszczak, Grounds, Boga, Dacres-Cogley. Sheffield United: Blackman, Baldock, Stevens, O'Connell, Stearman, Basham, L Evans, Fleck, Lundstram (Sharp 60), Duffy, Donaldson (Wilson 82). Not used: Eastwood, Leonard, Lafferty, Holmes, Brooks.